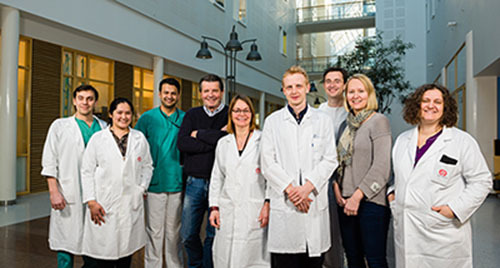 The Langmoen Lab is a translational research group for neurosurgery at Oslo University Hospital. We explore the biology underlying neurosurgical conditions. Our research efforts encompass both normal and cancer cells from the human brain. The studies on brain cancer are focused on glioblastoma which is both the most frequent and most deadly brain cancer (median survival in unselected series ≈10 months). We participated in the identification of stem cells in glioblastoma. Following this we developed the first clinical protocol that targeted stem cells in solid tumors by transducing dendritic cells from the patients with their own cancer stem cell mRNA. This significantly improved clinical outcome. Almost one out of four of the patients are still alive. These patients have a median survival of 7 years and are still recurrence free. A randomized trial of the vaccine has now been certified by all required authorities. In this study we will use an improved version of the vaccine. Our intention in this study is also to clarify why some patients respond and others do not. In collaboration with our partners at the Finnish Institute for Molecular Medicine, we are combining the novel technical possibilities of high-throughput screening and deep sequencing with our established know-how on patient specific tumor stem cell cultures. Exploring a panel of 525 drugs established in clinical use, as well as drugs in early-phase development, we are screening individualized tumor stem cells for drug sensitivity. The approach has been coined Individualized Systems Medicine. The preclinical pipelines along with validation of screening results have been established in 2016. We are preparing to translate the strategy of individualized medicine to patient treatment in 2017. A major barrier to effective treatment in glioblastoma is the simultaneous activity of multiple survival and growth-promoting mechanisms. A conceptually new treatment approach has emerged focusing on coordinated blockade of native survival paths of GBM. The coordinated blockade is undertaken by nine clinically well-known and repurposed drugs concomitant with the cytotoxic and standard of care, temozolomide, in a drug cocktail termed CUSP9. We have evaluated the in vitro efficacy of CUSP9 in patient-derived GBM samples using clinical relative drug concentrations across several different experimental cell assays. The coordinated approach has demonstrated a broad efficacy among several patient samples and experimental cell assays, and as the drugs have well-known safety profiles the results are intriguing for translation to patient treatment. Glioblastomas are characterized by diffusely infiltrative growth. To investigate the invasive properties of glioblastoma cells we film cells while they invade into rodent brain slices or 3D-biomatrixes using time-lapse microscopy. We have identified subpopulations of cells with different invasive potentials. These cells display specific movement patterns and morphology. We hypothesize that these cells have diverging activation of signaling pathways and microarray expression analysis show their selective regulation of pathways and genes. We are currently focusing on confirming these findings on a single cell level. By performing a systematic comparison of gene expression in adult human neural stem cells and GSCs, we have identified differentially expressed genes that may have potential as new and specific targets for treatment of glioblastoma. Our results from exploring several of these genes and pathways in-depth, suggest a functional role for the Wnt signaling pathway, PBK and NAT12/NAA30 in GBM. As a strategy to more efficiently and directly identify targets that are likely to trigger a therapeutic response, we are currently focusing on genetic high throughput loss-of function screening as tools to identify both individual and shared target hits in patient derived GSC cell cultures.